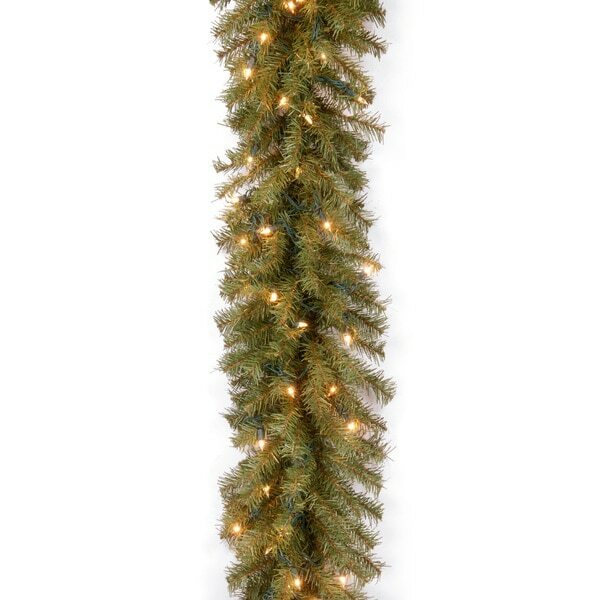 Accentuate your home for the holiday season with this 9-foot fir garland from the National Tree Company. This fire resistant and non-allergenic garland comes pre-lit and ready for decoration. Great pricing on this garland. Easy to work with and can add decoration to it. Love this garland! It is perfect and reasonably priced. The perfect compliment to the rest of our Christmas decorations! Has a real look and is very sturdy! Wife loved this garland. Looked great and was high quality. A bit too skinny...looks cheap but I hope to doctor it up with lots of ornaments and flowers etc. Choosing garland was tough. I read a ton of reviews and looked at items from various price ranges. So glad this was my choice. It fits perfectly on my mantle and looks great. No issues all season and can’t wait to use it again next year. Very full garland with plenty of lights. The only issue I had with this item, and it could have been my fault; I thought the item was battery operated, not electrical. The places I wanted to use the garland were not conveniently near an outlet. That was my only drawback. This is a delightful garland. Perfect for my cabin and love the price. I will be purchasing more of these. This garland fits my Mantle beautiful !! Very well made and looks like real fir ! Was a little disappointed with the quality. Extremely brittle feeling, super pokey. Garland I have purchased in the past was softer to touch and looked more real than this one. Love it. Looks beautiful on our front porch pillars. Lights are soft white and look nice at night. Good quality. Hope to use for many years. Really great quality, looks good up close. We wove it through the stair rail and it works nicely. Needles are well secured, no bits to clean up. I loved the price but it was not as full as it looks. I added some ribbon and small ornaments to fill it up and it looked great !! "Can 2 or more strands be connected to each other?" "Is this plug in or battery operated?" "Can two strands be plugged in together?" "Can this garland be used outdoors?" I wouldn't use it outside, but it works great inside! "How many lights does this garland have?" This has 50 clear lights. Looked like a great price!